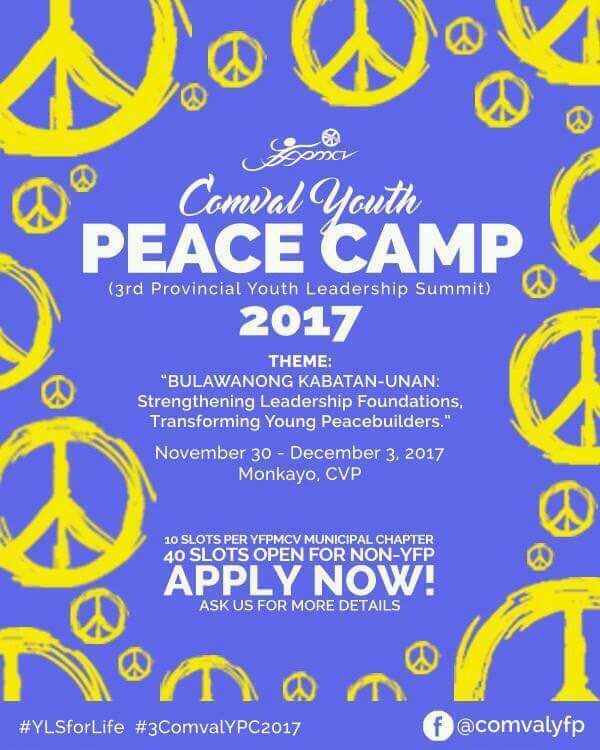 Youth for Peace and Development Movement Philippines will host the ComVal Youth Peace Camp as the 3rd Provincial Youth Leadership Summit on November 30 – December 3, 2017 at Monkayo, CVP with a theme “Bulawanong Kabatan – Unan: Strengthening Leadership Foundations, Transforming Young Peacebuilders”. 40 slots are open for new potential Young leaders. There will be 10 slots per YFPMCV Municipal Chapters. For any inquiries feel free to message @comvalyfp. Hope to see you there! Be the hope and actors of positive change of our country Now! 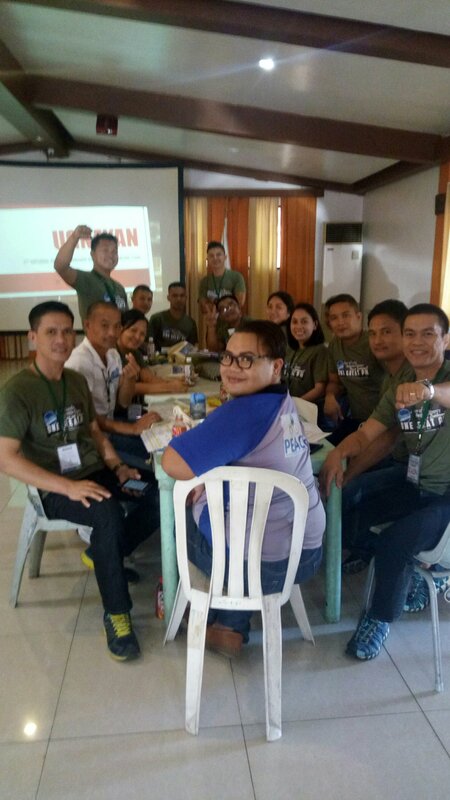 ​CRSAFP, Camp Aguinaldo, Quezon City – The task organization of the facilitators for the 4NYLS is established.. Ugnayan Leaders and members are now planning for the systematic and effective ways of facilitating the activity. 4th National Youth Leadership Summit is on October 23-28, 2017. The 126 participants will arrive tommorow at the venue via C130 Aircraft. Evryone is excited for this summit. 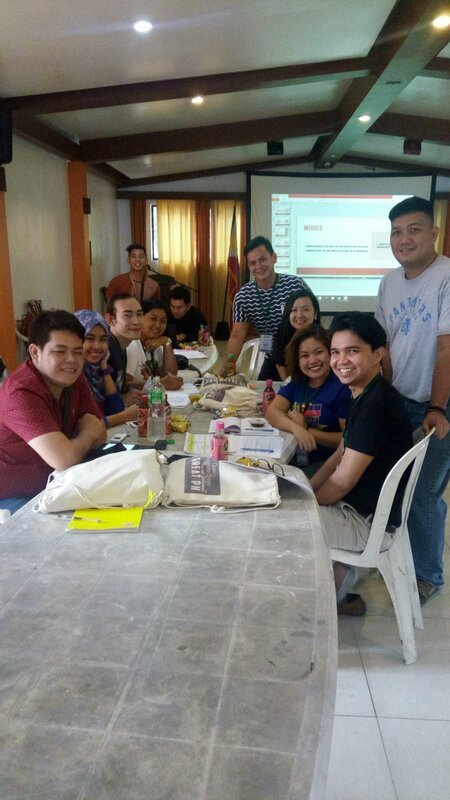 CRSAFP, Camp Aguinaldo, Quezon City – During the Facis’ Training, Mr. John Patrick Y. Onggao, President of Youth for Peace and Development Movement Philippines discussed about the YLS and NYLS History to the facilitators. This is part of the leveling of expectations of the 4NYLS facilitators. 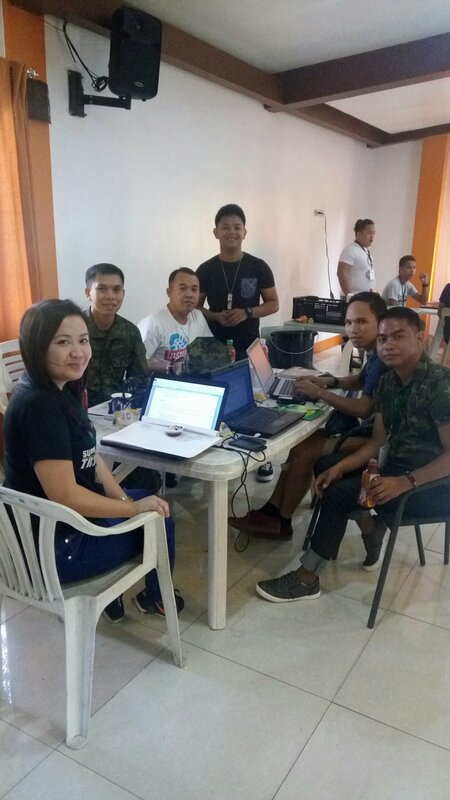 Moreover, a preparation for the successful conduct of the 4th National Youth Leadership Summmit at Bakasyunan Resort and Conference Center Conference, Tanay Rizal with 126 Youth Leaders as participants. Civil Relations Service, Camp Gen Emilio Aguinaldo, Quezon City – The Facilitators’ Training for the 4th National Youth Leadership Summit (4NYLS) formally opened this with Col Jose Victor L Vargas Jr PAF (GSC), 7CRG Group Commander as the keynote speaker. The participants are composed of the 15 National Officers of Youth for Peace and Development Movement (YPDMP), 3 Multi-sectoral Advisory Board, 5 Officers and 13 Enlisted Personnel Soldiers and 7 CRG Personnel as secretariat. Col Vargas in his speech encouraged the facilitators to work harmoniously for the success of the 4NYLS. In return, all ideas consolidated by the body will be fully supported by the Secretariat. They were welcomed by 7CRG, Deputy Group Commander Cpt Joffrey R Trania PA (AGS). This training will be until tomorrow, October 22, 2017. Arrival of the facilitators from different part of the country to 7th Civil Relations Group in connection with the Facilitator Training for 4th National Youth Leadership Training today, 20 October. Your Armed Forces of the Philippines through 7th Civil Relations Group, Civil Relations Service, Armed Forces of the Philippines and other peace partner agencies will conduct the 4th National Youth Leadership Summit (NYLS) on October 23-28, 2017 at Bakasyunan Resort and Conference Center, Tanay Rizal. This year’s NYLS theme is “Youth Leaders, Working towards Greater Change”. Through this summit, we can further solidify the youth’s support and commitment to nation building and development of our country. This annual summit is a gathering of youth leaders where your AFP and other agencies can interact with the youth to know what has happened all throughout the year. Aside from the lectures, workshops and team-building activities given to them, it is always a venue to extract good ideas and leadership strategies. This year’s vision is to further develop management capabilities and organizational sustainment of these empowered youth leaders of our nation who are one of the key players and benefactors of development and nation building. The YLS is conducted through various levels, from national down to, regional, provincial, municipal, and even the barangay level. Today, the conduct of YLS marks its 14th year, through the help of your AFP, the YLS family continues to grow every year. The AFP wants every youth to be a part of the YLS family/graduates for it teaches not only leadership, but it also teaches peace, positivity, and how to be a good and effective citizen. So, to all youth for peace and development, See you soon! Youth for Peace – National Capital Region President Hisham Panganting participated in the Epic Youth 2017. It was a 6 day seminar-workshop program held at De Lasalle University, Vito Cruz Manila on September 24 to September 30, 2017. EPICYOUTH2017’s main objective was to educate youth who were prone to any violent activities and to prevent them in engaging vicious actions. It was also addressed to the youth leaders in Manila to pass on what they had learned from the workshop to their community. Participants were youth ranging 18-25 years old, from different places in Manila including Cavite who committed to join the 6 day live-in workshop. There was also workshop held in Zamboanga City in collaboration with the participants in Manila. The venue was at American Corner in De Lasalle University while the accommodation was the dormitory of the scholars in the University. The topics were focus on peace, conflict and violence on how to engage it in society in the propagation of peace and prosperity and to learn how conflict and violence be managed. On the first day of the Program, the participants introduced themselves to the group and they draw a pathway to show their motivations in attending the workshop. Participants’ pathways were shared to everyone to know their reasons and motivations in attending the workshop. The second activity was the so-called Team and Trust Building, the participants need to achieve was to hold the chair in slanting position and maintain its position until the allotted time of 8 minutes. The game’s main objective was to build cooperation and trust between and among participants to maintain the position of the chair while transferring to other chair. What happened was we did it successfully. The participant’s third activity was an exercise in identity; each participant wrote things and adjectives that would describe their selves. After writing it down, they shared it to everyone. The purpose of this exercise was to show that each one of the participant has its unique characteristic and that everyone is different from one another. But this exercise taught the participants that though we have unique characteristics we still have similarities. Participant’s fourth activity was a video conference together with the participants in Zamboanga City, titled “Introduction to Islamic Understanding on Violent Extremism” by Alim Abdulmuhmin Mujahid, Executive Director ARMM Regional, Darul Iftah. Sir Mujahid, discussed to us the true teachings of Islam which was non-violence. He said that Islam never taught Muslims to kill but Islam taught Muslims to be kind and have mercy to human kind. Sir Mujahid; the speaker, was awarded certificate of appreciation of being part of the workshop. The last part of the program was a lecture in “Peace and Violence” by Sir Jun. He discussed the meaning of violence. He cited one definition of violence from John Galtung, according to him violence was avoidable impairment of fundamental human needs. He also discussed to us three kinds of violence. According to him, direct violence or physical was the actual action of violence like killings, second was cultural violence were traditions that caused damage to the human needs of a person, for example the mindset that women should only stay at home and should not go to school and lastly structural violence, these were violence that does not directly caused by a person, like corruption. He also taught the participants, the two kinds of peace, the negative and positive peace. Negative peace was the kind of peace implemented in the society to stop violence for example curfew while Positive peace was policies implemented in the society to educate people. In the second day of the program, we had an ice breaker at the same time an exercise together with the participants in Zamboanga City. Participants in Manila danced with the participants in Zamboanga through video conference. This escalation and sources of conflict were only some reasons on why people were fighting each other. This is because everyone has its own context, attitude and behavior, if not carefully understood by everyone there will be a big possibility of conflict. This discussion was followed by a topic on the Strategies to avoid conflict or the so-called “Conflict Management”. To resolve issues and to avoid conflict, sometimes you need to avoid something to prevent conflict, sometimes you accommodate depending on the relationship you have to a person. The program ended in a topic on “Youth Vulnerability to Violent Extremism in ARMM” through a video conference from Zamboanga City. The lecturer showed us the statistics on why youth in ARMM were joining to violent extremism; the study showed that the main reasons were poverty and lack of education. The study had 4 case studies which were interviewed by the researcher; they found out that those youth joined violent extremism because they want to revenge their parents after they were killed. His lecture was not recorded because the study was not yet published in ARMM and subject to any changes. The day started again with an exercise, after that the participants had a video conference with Ms. PC Mayane and had a lecture on “Violence in Communication, Ethnolinguistic Violence, Hate Speech, Fake News and Bashing Online”. She is currently working in Globe, and taught us that people should be mindful in posting in social media. She said that every time you interact there is an impact. Participant’s next lecture was about “Communication Model” by Sir Jules Benitez from Zamboanga City through video conference. He taught us how message was relayed from one person to another through the so-called channels. Participant’s third activity was a game; the rule of the game was to “Gain points as much as you can”. The exercise consists of 8 rounds, each group in each round; independent to each other, makes a decision, writes it on a piece of paper and hands it over to the leader of exercise. The decision is a choice between two options, X and Y. The group may make a profit or register loss in each round. The extent of the profit or loss depends on the sub total of the decisions made by the group. They are calculated in every round. The result was failure, because this was a unity game, the purpose of the game was to gain points as much as we can, but every team only thinks of their selves rather than as a whole team. If every team chose Y, the whole class will have a positive result. What we had learned from this game was if we will relate it to the real situation, this was true, because everyone is only thinking its own self-interest rather than a the interest of the society. It was much better to help one another rather than fighting each other on the resources. The last session of the day was a Digital Thumbprint Session by Ms. Paola Cortes from Google. She discussed some statistics in the Philippines on how Filipinos were fan of using social media platforms. It shows that out of 103 million populations in the Philippines 60 million of it was internet users as data in 2017, 88% percent of it were using mobile phones. Imagine how wide the spectrum of social media users in the Philippines. Posting in social media, you will have a possible 60 million viewers. According to the research Facebook is the number one social media platforms used by Filipinos. Participant’s first session was a whole day discussion focusing Social Media Peace Building with Ms. Paola Cortes from Google. In this day, she discussed to us on how to use Adobe Sparks in creating multimedia for the Social Media Peace Campaign of the participants. She taught us how to improve Facebook pages for the campaign of each team’s advocacy. The class was group into four, a group from Taguig, Manila, Cavite and Valenzuela. And I was with the Group Taguig. Our group’s peace campaign was about religious discrimination. Our concept was to make a social media experiment and to interview Muslims regarding their different experiences of being discriminated. After the discussion Ms. Cortes gave us time to develop our page cover photo and to create our own logo. Ms. Cortes session was ended through discussing Adobe Sparks. The last session of the day was the discussion about “Transforming the Nation through Values”. Each characteristic was taught to us by M. Zaynab Ampatuan to be part of change in the society through these characteristics. This day was the final presentation of each group peace campaign together with the participants in Zamboanga City. There were 8 presentations, four from Manila and four in Zamboanga City. Our presentations were being judged by the representative in US Embassy and the Executive Director of Peacetech. The winner will be granted P25, 000.00 for the continuance of the campaign. Every participant will give their comments and scores to all presentation. Each participant were given a grading sheet to rate the overall presentation.